There are two free, online tools designed to help make it easier to find the best values when searching for paid or award stays at chain hotels: award mapper and Seth Miller's Hotel Hustle. I use them both all the time, and want to share my thoughts on the strengths and weaknesses of each tool. There are two things I love about award mapper and one thing I hate about it. First, what I love: the selection of hotel chains and range of points is persistent across searches, and it shows all the corresponding properties within your search area. That lets me select all the chains whose points I'm considering using, then plan a whole trip by simply changing the city being searched. 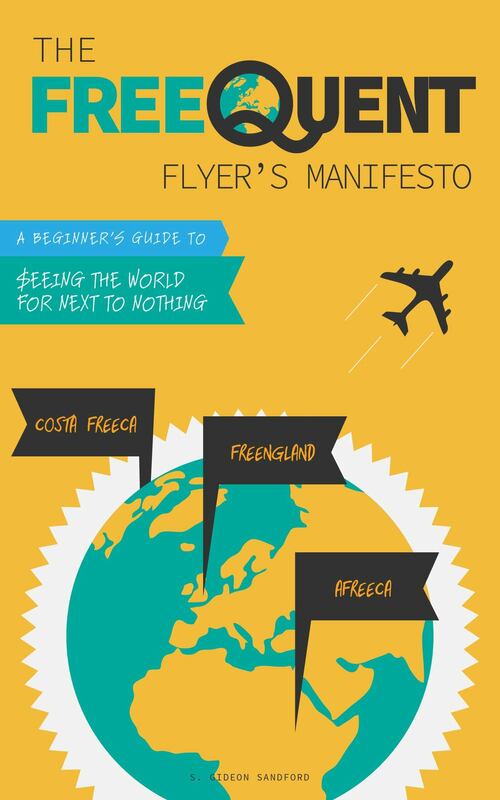 This is fantastic when you're planning something like our winter jaunt to Italy. I know which chains I have points in, so all I need to do is change the city being searched to see which cities have properties that are conveniently located and within my points budget. All award mapper knows is that the Hilton Prague is in the Hilton category that ranges from 30,000 to 50,000 HHonors points per night; it's not interested in telling you the price you'll pay. To find that out, you'll have to use the HHonors Points Search Tool, or search for the dates you're actually interested in (only in June does the Hilton Prague cost 50,000 HHonors points; the rest of the year it costs 30,000). Similarly, Category 1 and 2 Starwood Preferred Guest properties cost 1,000 fewer Starpoints during the weekend, but award mapper can't give you the actual points price on a given date. For Hyatt, IHG, and Marriott rewards I use 1 cent, since that's what my transferrable Ultimate Rewards points are worth when redeemed for cash, instead. 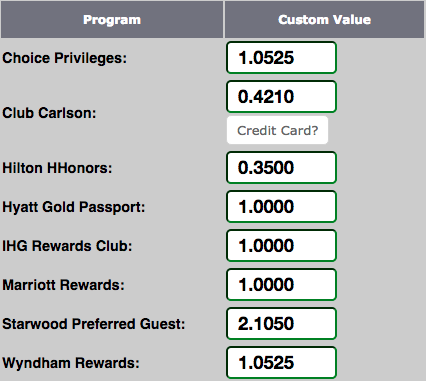 Hilton's 0.35 cent value is based on a comparison of 6 HHonors points per dollar spent with the American Express Surpass card versus 2.105 cents per dollar spent with a Barclaycard Arrival+ card post-devaluation. The same logic applies to the Starwood American Express (1 Starpoint per dollar) and Barclaycard Wyndham Rewards (2 Wyndham Rewards points per dollar). Once you've configured your values, you can search for the actual cash rates available at each property in a city, and the actual points cost of those same properties. You can also filter by rewards program (click the asterisk by a program to show only those properties), but those filters are not persistent across searches, unfortunately. if you filter by 5 Hustle Hotness stars, you'll see all properties where a points redemption saves you more than 145% of the value you assigned to the points. In other words, the more stars, the higher the revenue cost compared to the value of the points required for a redemption. Since I can usually bring down the revenue price by searching for AAA rates or using corporate codes, I always filter by 4 or 5 Hustle Hotness stars. Award mapper and Hotel Hustle are complementary tools, and I use both many times each week, especially when I'm planning a trip to a new country or city. I use award mapper to get a feel for what chains and properties are available in a city, then as my plans come together I use Hotel Hustle to narrow in on the specific dates and properties I'm interested in. Finally, I go to the hotel's website to verify rates, see whether additional discounts are available, and to make my points reservations.